Waterproofing your home is one of the most effective ways to keep your family safe and protect your investment. However, many homes are not properly waterproofed during the construction phase and this factor is often overlooked by new home buyers. As a result, many homes are at risk of expensive, destructive water damage. Water damage in basements often wreaks havoc on the foundation of your home. Even just a small crack in the foundation can lead to several serious issues including mould, mildew, and severe flooding. This makes waterproofing your basement even more important. Brothers Plumbing has been waterproofing homes since 1977. With the finest modern tools and extensive training in waterproofing, Brothers Plumbing offers exceptional plumbing services for homeowners and business owners in the Toronto area. By protecting the foundation of your home, you are combatting the leading cause of water damage to buildings in Ontario, which can save you a fortune. Small leaks can create large hotspots for mould and mildew, especially in warm, dark areas of your home. Often, these leaks are completely invisible and go undetected for years, allowing a small problem to grow into a massive expense. While mould and mildew can contribute to structural damage of their own, they also pose significant health risks for you and your family. From severe respiratory issues and skin conditions to fatigue and joint pain, mould can have a long-term impact on your health. Beyond the health risks, black mould is also extremely invasive and can spread throughout your walls, ceilings, and carpet with ease. Not only is it difficult to remove, but it can also be a sudden and unavoidable expense. For home protection and peace of mind, be sure to waterproof your home specifically to prevent mould growth. As well, do routine checks of your entire home to ensure any mould is found while it is still in its early stages. If you see signs of mould, mildew, or other water damage in your home, be sure to contact an experienced plumber to assess the damages and provide a quote for repairs. Beyond damage to your home’s foundation and electrical system, rust is also an unfortunate symptom of water damage. For homes with metal structures or steel beams, rust causes the metal to lose its strength and shape. It can affect the integrity of your ceiling and walls, and it can also leave unsightly rust stains as the water leaks into your walls and floors. Especially for houses with steel and metal in the ceiling, waterproofing the roof of your home is a must. Without proper waterproof shingles and underlays, the ceiling of your home will be prone to leaks, rust, and a variety of structural issues. Not only can water damage destroy the foundation of your home, but it can also ruin the wiring and electrical system. As the water damage spreads through the floors and walls, it contacts the wiring of your home, which poses a risk of electrical fires, electrocution, short-circuits, and even a complete a loss of power to the home. This risk compromises both the integrity of your home and the safety of your family. Fixing the entire electrical grid of your house is an expensive and exhausting process that requires a great deal of work. 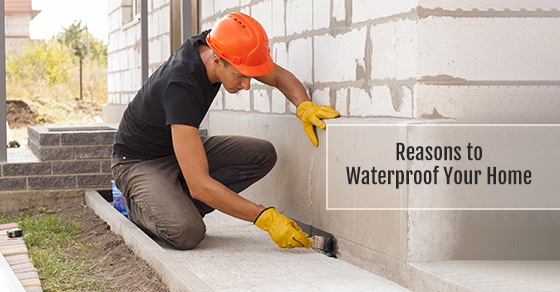 Instead, simply protect your home from this damage with comprehensive waterproofing services. At Brothers Plumbing, we tailor our services to the needs of each individual home, maximizing the protection your home receives in the most efficient way possible. We have decades of experience waterproofing indoor and outdoor elements of residential properties, and we are fully qualified to assess the needs of your home. The unexpected expense of water damage to your home can debilitate your savings account and leave your family in an unsafe structure. By waterproofing your properties, you can defend against these forms of damage and even increase the value of your home. Prospective buyers will be happy to hear that you have already invested in extensive waterproofing, and they are often willing to pay more for that kind of security and peace of mind. For commercial and residential real estate developers, we recommend incorporating our waterproofing techniques during the design and construction phase to minimize expenses and build each home to last for decades. Although waterproofing can be a costly investment, the expenses pale in comparison to the price of repairs, and you may even be able to recoup your investment when you sell the house. Your safety and security are worth the investment. At Brothers Plumbing, we understand that the safety of your family and your home is your top priority. We pride ourselves on our ability to offer our customers long-term waterproofing at an affordable price. We offer our customers a 100% satisfaction guarantee, and we are willing to put our reputation at stake every time we go to a job. For more information about waterproofing your home, or to book an appointment with one of our experienced plumbers, call Brothers Plumbing at 1-800-742-0018 or contact us here.